Terminal emulation OCX component toolkit. Tightly integrate terminal emulation into your Windows application. TTWin Integrator revolutionizes the way Windows® based applications access corporate systems on legacy hosts. With our OCX component host connectivity is tightly integrated into your Windows application allowing for unprecedented flexibility in the management of data and state of the art look and feel while retaining all the benefits of the platforms. TTWin Integrator is extremely powerful yet simple to use. Integrator goes beyond simple screen scraping, and offers full control over the datastream, as well as presenting status information to the application. All this is done without compromise in performance. TTWin Integrator is the ideal product for OEM or systems that require access to host information, but need to present a user interface consistent with today's generation of Windows applications. By using Integrator the application can transparently communicate with a number of different host applications, on a variety of different hosts. This can occur either visibly or invisibly, and places no restriction on the application. Performance benefits inherent in mainframe host based applications are retained, and data from a variety of host systems can be combined to be presented to the user in the most appropriate way. Updating host information is simplified because there is no need to re-enter redundant data. TTWin Integrator can print to any Windows mapped printer. The emulations you need are available in the one pack, at the one price. TTWin Integrator provides the power to create an individual environment to meet the specific needs without compromise, future proofing your organization. With the OCX Component Interface TTWin can be made a part of your external application. Through the interface the TTWin Integrator screens and functions may be accessed in a natural manner. With TTWin Integrator's OCX Control you can Screen Scrape information and represent the information as required. Configurable event handlers allow you to easily create triggers for host application events. You can choose how the emulation window is presented in your application. Or hide the control and turn your legacy host application into a full GUI application, with out changes to the host environment. Add two or more controls to your application and connect to two hosts at once. You can connect to two or more hosts using different emulation and connection methods. Pass information automatically from one host to another. Get information from multiple host and present it on the one screen. Turbosoft regards data security to be an essential part of a terminal session and as such, we supply industry standard encryption as standard rather than as an additional cost option. TTWin Integrator has extensive support for print through. This function is totally configurable and implements print through in a way that is highly effective in every environment. Screen printing is also supported, allowing regions of the screen to be printed. TTWin Integrator has powerful character selection facilities to cater for the complex character set requirements found in many languages. 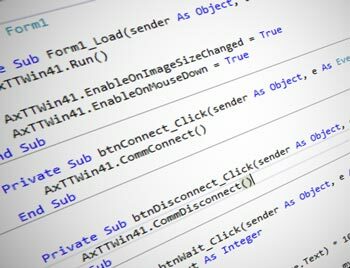 TTWin Integrator comes with full code page support. Emulations may use as many code pages as required. What's more, each emulation can do this independently from other sessions. TTWin Integrator offers full support for double byte character fonts, including Chinese, Korean, and Japanese language fonts. TTWin offers support for True type fonts. To improve the legibility of TTWin Integrator sessions at a variety of sizes, Turbosoft has developed a algorithm to automatically scale the font size to best fit the size of the TTWin Integrator window. The keyboard mapping is extremely flexible. Users can map text strings, host sequences or emulation keys to any key combination on a PC keyboard. With TTWin the keyboard mapping may be done either through the intuitive graphical keyboard mapper, or through the extremely powerful non-graphical method.